Saw this pattern on Ravelry yesterday and I had to see how it was done. NOW. I stayed up way too late last night (this morning) to finish the sample and block it — only to wake up to the sounds of drums and singing from next door. At 7 AM. On a Saturday. It’s a very interesting way to bulk up the yarn for the center block without weaving ends in for every block. If you work from a single skein from beginning to end, you only have the start and end tails to weave in. Very cool. It will take a bit of practice to keep the block edges tidy. 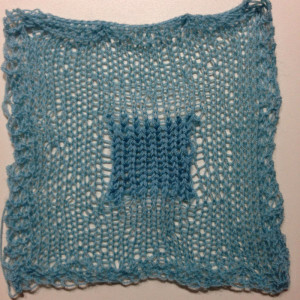 I didn’t block very aggressively because I bound off too tightly. I think strong blocking will emphasize any sloppiness at those edges too.